Anxiety is a problem that many COPD sufferers struggle with as they manage the symptoms of the disease. It is a natural response to breathlessness, the decline in oxygen levels that occurs during these episodes triggering a stress response in the body. That stress response typically makes breathing even more difficult, which causes greater anxiety – a viscous cycle that can take a severe toll on a person's health and quality of life. For that reason, learning how to manage anxiety is very important in terms of coping with COPD day-to-day. Certain regions of the brain serve as monitors for vital bodily functions, including breathing. When oxygen levels fall in the bloodstream, the brain sends an alarm signal – called the suffocation response – a stress response that is meant to prompt a person to move away from an external cause of poor breathing, such as an area with restricted or contaminated air flow, for instance. When this happens, it prompts the release of stress hormones and neurotransmitters that increase heart and respiration rates and constrict the airways. This causes the respiratory system to work harder, and in a person with COPD, increases the feeling of breathlessness that triggered these responses to begin with, as well as the fear and anxiety that comes of struggling to breathe. In a person who has COPD, frequent episodes of breathing difficulty can cause the suffocation response to become overly sensitive, prompting frequent bouts of anxiety or chronic underlying anxiety. Then, even small changes in the environment, such as a strong odor, or everyday minor stresses, like feeling rushed, can trigger the suffocation reaction. While COPD anxiety is a vexing issue that can certainly make a tough situation even more so, the good news is that COPD patients can learn to control it. Breathing retraining can help, which is learning how to gain control of breathing during episodes of breathlessness with breathing techniques, such as pursed lip breathing. Using such techniques can slow breathing, help keep airways open longer and promote relaxation, easing breathlessness and the feelings of anxiety or panic that come with it. Another good option for COPD patients struggling with anxiety is to ask for a referral to a pulmonary rehabilitation program. Through these programs, patients can be more thoroughly educated about their disease and learn a variety of coping strategies to control its symptoms and COPD anxiety more effectively. Medication may also be used to aid in controlling the anxiety. These may include anti-anxiety drugs or certain antidepressants that are known to help reduce anxiety. 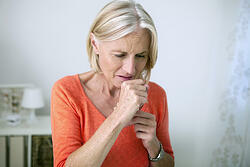 However, these medications must be chosen carefully, since some can slow breathing, worsening COPD symptoms. Additionally, medications are typically more effective when combined with other methods of reducing anxiety, such as relaxation techniques and/or breathing retraining. The most important thing to know about coping with this condition is that there is help available. Many COPD patients suffer with its effects in silence, becoming isolated or even housebound due to the fear of having the viscous cycle of breathlessness-anxiety-breathlessness descend upon them in public. By learning to control that cycle, patients can reclaim their lives, returning to a more active, social and enjoyable lifestyle.